Suggested Use: 1 tablet 3 times a day on an empty stomach. Cardiopeptase says “Be gone!” to pain, coughs, and hardened arteries! Cardiopeptase is LifeLink’s brand of serrapeptase — a ‘protease’ enzyme which destroys fibrous proteins by chopping them into pieces. The increasing popularity of serrapeptase as an anti-inflammatory and pain reliever is due, in part, to its extremely low toxicity and its lack of unwanted side effects. Unlike aspirin and many other anti-inflammatories, serrapeptase does not cause ulcers or stomach bleeding. 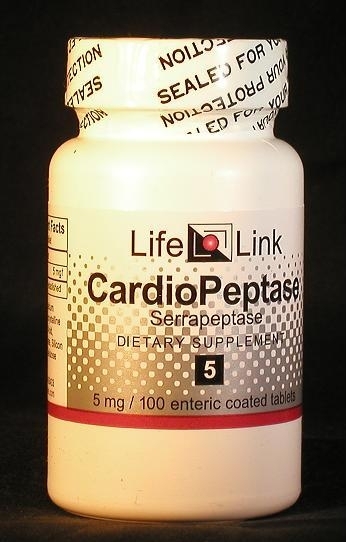 Cardiopeptase is LifeLink’s brand of serrapeptase — a substance extracted from the microorganism Serratia sp.E15. Serrapeptase is a ‘protease’ enzyme — that is, it is a protein that destroys certain other kinds of proteins by chopping them into pieces. Serrapeptase was discovered in the 1960s by Japanese researchers who were studying silkworms.1 Silkworms spin silk into cocoons, which protect them while they transform into adult insects: silkmoths. When the transformation is complete, the moths escape by dissolving holes in the cocoon’s silk. They do this by making use of the Serratia bacteria that live in the insects’ digestive tracts and which make serrapeptase. The early investigators of serrapeptase realized its potential as an agent for clearing fibrous deposits in the body. They soon discovered that it also has anti-inflammatory properties1 and that it improves the tissue penetration of antibiotics.2 During the next two decades it became widely used clinically in Europe and Asia.3 Its reputation eventually worked its way to the United States where it is now increasingly used as a supplement and treatment for various conditions. Accordingly, we will limit our discussion of serrapeptase to a brief summary of relevant research, and let you draw your own conclusions about what medical conditions it may be effective in treating. Treating breast engorgement15 (a condition during breastfeeding that occurs when more milk accumulates in the breasts than the infant consumes). Serrapeptase has aroused a great deal of interest as an agent for preventing or treating cardiovascular disease — in particular, atherosclerosis (‘hardening of the arteries’). According to current thinking on this subject, plaques form where artery walls have been injured by the immune system. The plaques accumulate debris from dead immune cells, fatty materials, and fibrous proteins like fibrin, elastin, and collagen.19 The plaques are held together by the fibrous proteins; serrapeptase can destroy fibrous proteins; therefore, it should come as no surprise to find that serrapeptase weakens arterial plaques and helps them to dissipate. One of the reasons for the increasing popularity of serrapeptase as an anti-inflammatory and pain reliever is that, unlike aspirin and many other anti-inflammatories, serrapeptase does not cause ulcers or stomach bleeding. Its toxicity is extremely low18 and (unlike most other anti-inflammatories) it rarely causes unwanted side effects. Is serrapeptase useful for the conditions and purposes mentioned above? We aren’t allowed to tell you, so you should take a look at some of the references cited here, and then decide for yourself.